I love homemade chocolate and making little decorative easy chocolates from scratch. It’s a fun activity and the chocolates taste so good! 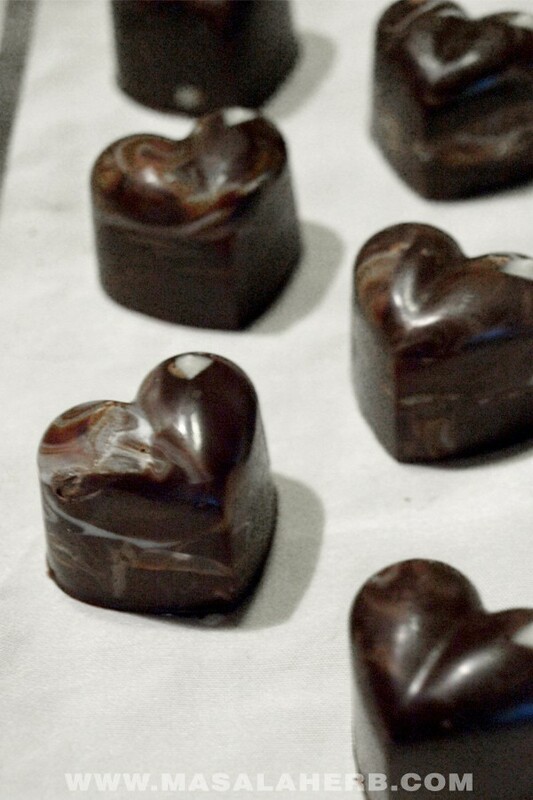 The best part is that you can make homemade chocolates quickly too without much effort! Of course I will always enjoy some good quality commercially available chocolates, especially those Swiss, French and Belgian ones. We grew up with chocolate, its everywhere in Europe! My favorite chocolate is the dark 70% bitter chocolate and the dark chocolate with Chill or with Pistachios. As a child, I had different preferences, let’s say I was on the sweeter side, but by now I tend to eat chocolates in moderation and I choose the ones with less sugar. I had made those chocolates in the picture for my grandfather and of course my father and my husband who have a very sweet tooth. Little homemade chocolate make a great gift and produce endless smiles! How to make Homemade Chocolate from scratch? To make Homemade Chocolate from scratch is not difficult. I am sharing 5 different versions of easy homemade chocolate recipes much further below, so that you get the idea what you can make. Basically you can be creative in the chocolate making process and the best thing is that it won’t take much effort or knowledge. Should I temper my chocolate and what is tempering? Tempering chocolate is a technique where chocolate is heated to a precise temperature and cooled again, just so that the chocolate has a flawless look and sound to it. That means tempered chocolate is shiny and produces a crisp snap when biting into it. Chocolate that has not been tempered looks dull and has a waxy white spotted layer. So, while tempering chocolate sounds like an extra step and a complicated science, it is actually not and you should do it if you want your chocolates to look great as a gift. Basically as a rule of thumb, try to always use only quality chocolate. That already reduces the chances that the chocolate gets that waxy dull look. Next, what you need to do is melt 2/3 of the chocolate in a double boiler/bain marie, while stirring frequently so that no bits are left, and then add the rest of the chocolate to melt and reduce the temperature, so that at the end your chocolate reaches the temperature of 31 Celsius/88 Fahrenheit. At that point it would make sense to use a food thermometer. That’s all what there is to tempering chocolate. Afterwards simply pour the molten tempered chocolate directly into the molds before it hardens or gets further heated. 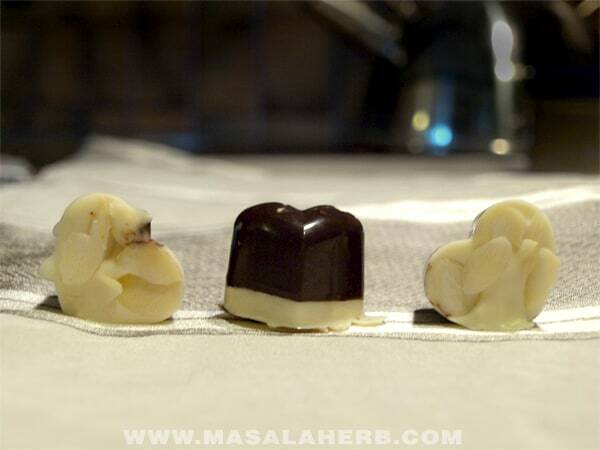 Today, I am sharing various ways to prepare little homemade chocolates. That should give you some ideas about what can be done in terms of decoration and flavor addition. These are the basic plain & easy homemade chocolate prepared with dark chocolate. Dark chocolate is high in antioxidants and if you use organic cooking chocolate you will have a healthier version of homemade chocolates as they will be without added sugars and low carb. Basically you can adapt this recipe more as seen in the recipe cards further below. Keep in a double boiler/bain marie to melt 2/3 of the chocolate, melt and add the rest to temper the chocolate (see instructions in post) or if you don't care to temper just melt the chocolate simply. Pour the Black Chocolate into the mold. Let it cool until hard, this might take a while so keep aside. Work with 2 bowls, one for the black chocolate and one for the White Chocolate. Keep in a double boiler/bain marie to melt ⅔ of the chocolate, melt and add the rest to temper the chocolate (see instructions in post) or if you don't care to temper just melt the chocolate simply. Pour the Black Chocolate first half amount into the mold. Now pour the white molten Chocolate on top to finish it off. Let it cool again until hard, then take the chocolates carefully out and store them in a cool place. Keep in a double boiler/bain marie to melt 2/3 of the chocolate, melt and add the rest to temper the chocolate (see instructions in post) or if you don't care to temper just melt the chocolate simply. Mix the chopped hazelnuts and chili flakes into the chocolate. Pour the chocolate until full into the molds. Take the chocolates carefully out and store them in a cool place. Grab something like a fine kitchen brush or toothpick and dip it into some dark chocolate and draw the face and other details. Keep in a double boiler/bain marie to melt 2/3 of the chocolate, white and black chocolate together, melt and add the rest to temper the chocolate (see instructions in post) or if you don't care to temper just melt the chocolate simply. Once molten, just mix a bit but not fully! 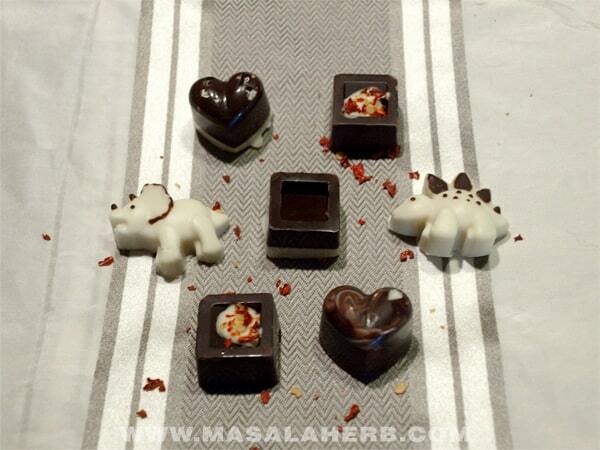 We want that marbled effect when pouring the chocolates into the molds. 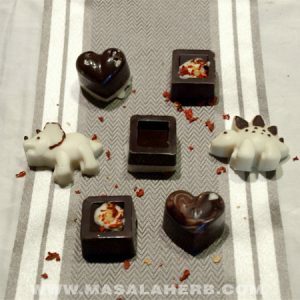 Dear Reader, have you ever made your own chocolates at home? The post, easy homemade chocolate recipe, was first published the 19th November 2012 and has been updated and enhanced ever since. I haven’t made homemade chocolate like this in about a year I think – probably around this time last year. These look fantastic and I love all the variations you’ve made. How fun. I will have to try these. These are absolutely amazing! If you showed me the picture without the post, I never would have guessed they were homemade! Amazing. Truly. I love the animal ones especially! Yummy chocolates. Will try dis. Do u have any chocolate recipe where I can use cocoa powder instead of chocholate bars? Yeah try them out they are easy and fun to recreate. Ah no you can’t use chocolate powder, that wouldn’t work out. All of these chocolates are fabulous! I especially love the chili chocolate ones. What a great combination! Your molds are so cute. I love the idea of little chocolates for gifts! Great chocolates! 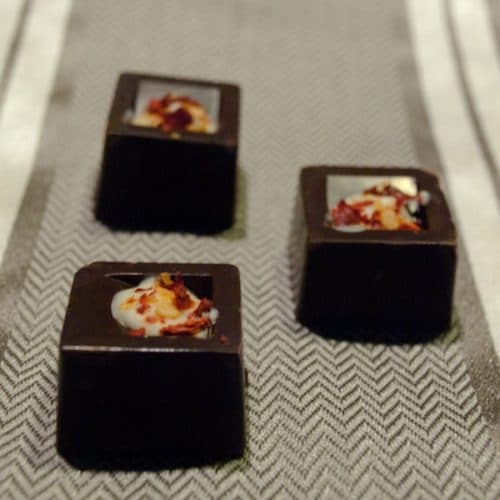 I love the chili chocolates – chocolate goes so well with spicy flavors. And this is the time of year when we tend to eat more chocolate, so this post is extremely timely. Thanks so much. I haven’t made chocolates yet.. you sure are tempting me! I love these, they’re so cute.. and chili chocolate? That must be so yummy!! THANKS for teach us so much!! it’s always a pleasure to visit your blog…it makes me so hungry!!! I want to eat the screen ! These Christmas chocolates are divine. Thanks for sharing the recipe, Helene! Your chocolates are just lovely–I’ll have to try the ones with pistachios and chili. Spicy/sweet is one of my favorite flavor combos. Today at the kitchen store, I saw these mini molds. I didn’t think it’s for chocolate! Wow homemade chocolate candies seem so fancy and I love how easily you made several kinds! Your friends and family who receive these as gift are lucky!!! you can use those molds for chocolate and here in goa they use them as well to make colored marzipan for Christmas. 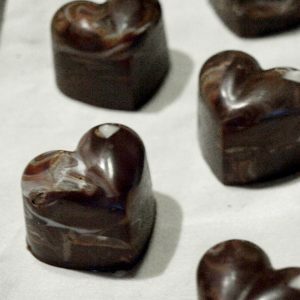 Hi Helene, what a great, and timely post – I’ve been wanting to make my own chocolates at home for some time, though I really want to make my own filled chocolates, with like ganache, or praliné inside, but I have no idea how to make them “hollow”. Any ideas for this? If not I guess I can make solid ones – they’ll be just as delicious. Yours are so pretty – lovely gift idea too! I have made so many chocolates in my life – but am getting tired and the family doesn’t eat like it used to… I still do chocolate cherries every year – and my B52’s! I have never posted them, but hope to this year! 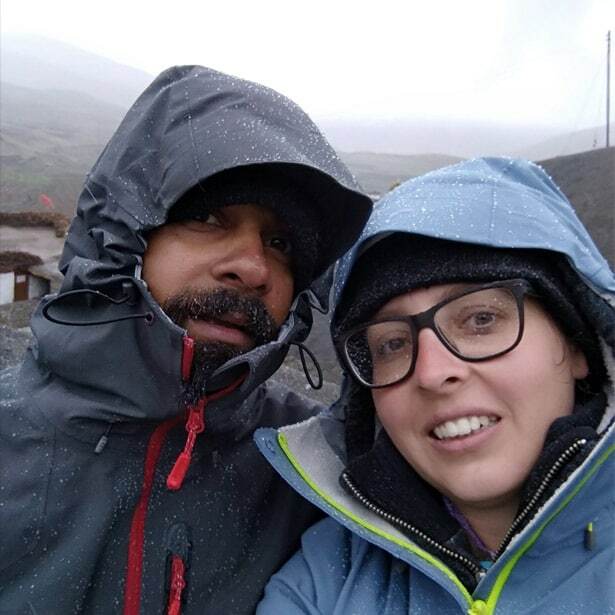 Yours are stunning and so much fun! We are getting our house painted. Usually I am getting ready for Christmas in September, but haven’t started yet. You have really got it going on! I’ve been wanting to make some as gifts without tempering, but afraid they might melt when I deliver, the weather here is super hot. Ah in that case you ll require to temper them. Still I can’t guarantee that they won’t melt. In general chocolates are always kept in fridges here in shops. Only those ugly cadbury chocolates are kept outside, but they contain some kind of substance which makes them not to melt. Even Snickers and all melt in the heat. =/ Maybe you can keep them in some kind of isolated bag when you roam, after having them kept in the fridge before. You get those pocket ones in different sizes, just keep them in there so the coolness remains and prevents them to melt. We do that when my mum sends me chocolates from Europe and they don’t melt in that way. 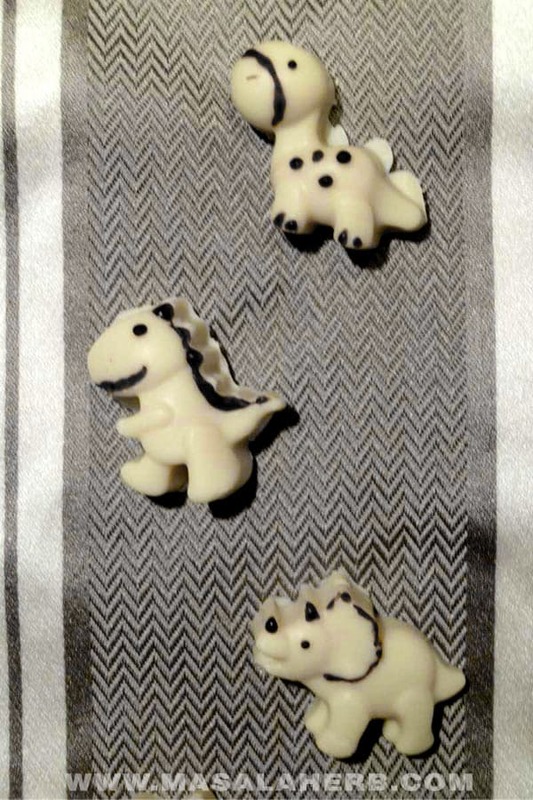 Love these adorable chocolates! Making your own chocolate treats for Christmas is so fun. 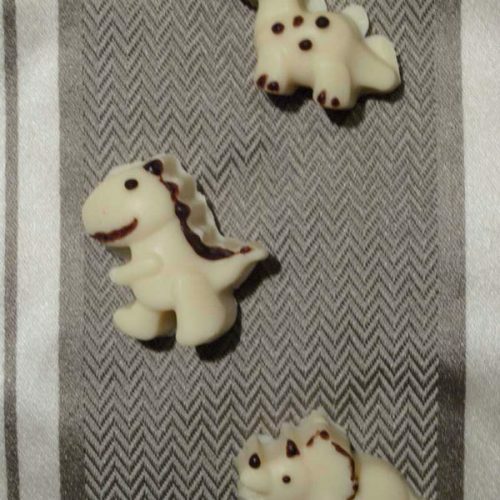 The white chocolate animals are my favorite! Belgian chocolates are my absolute favourites. I find a lot of chocolate in India too sweet. Here my favourites are Amul chocolates. Now I prefer making them at home too. I can make them with whatever flavour I like best. Yes, chilli is something I also like. I love Belgian chocolate too, it’s so rich and deep in flavor! Have you ever tried chocolate form Kodaikanal? I didn’t like the chocolate in Kodikanal. I think in India, making chocolate at home is still the best option. 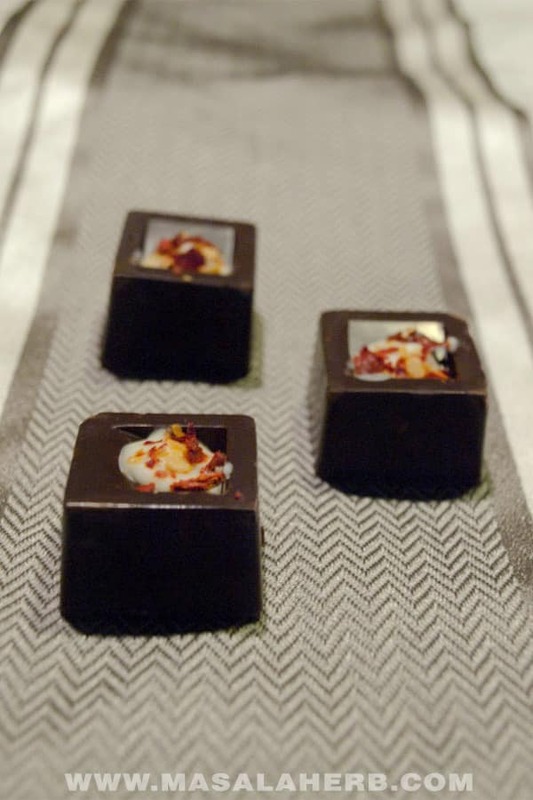 Where do you get cooking chocolates in Goa? I learned a simple recipe for coating the roasted almonds and other buts with chocolate. That is the only kind pf chocolate I like, but since then I have not been able to source the chocolate that I can melt and use. Chilli chocolates seem too adventurous for me. Anu, you can buy cooking chocolate of different qualities in the major supermarkets in Goa such as Oxford, Newtons and Ajays or there is a place next to the handicraft Goa government Emporium in Mapusa where you get only commercial baking ingredients. You can buy chocolate chips too in different variations. I’m thrilled & tempted to try these chocolates. My kids will definitely love them. Thanks for sharing these wonderful variants. 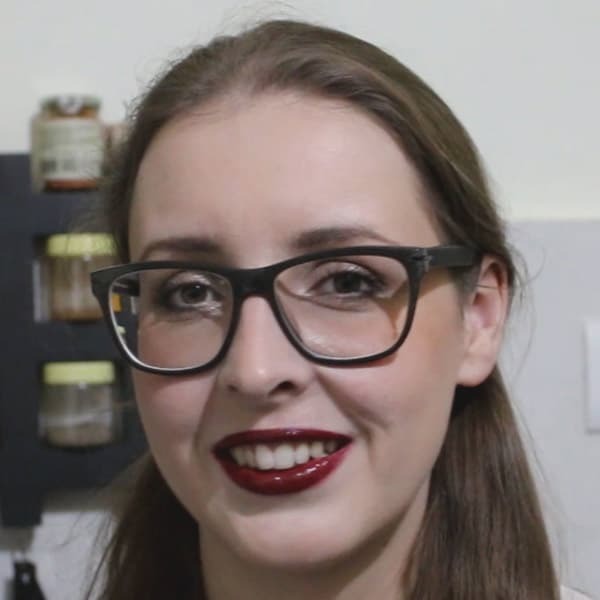 Hi, this may be interesting you: Easy Homemade Chocolate Recipe - How to incl. various flavors [healthier]!